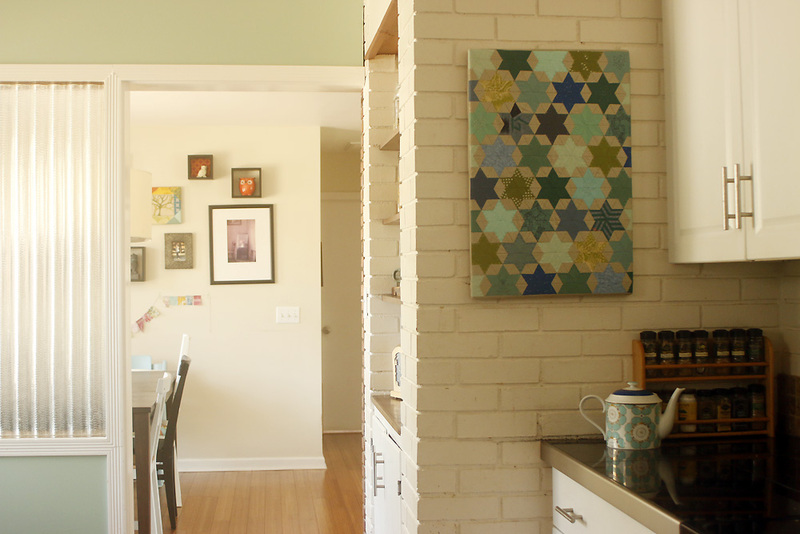 I've also been wrapping up little projects, including this hand quilted wall art I created for our kitchen. 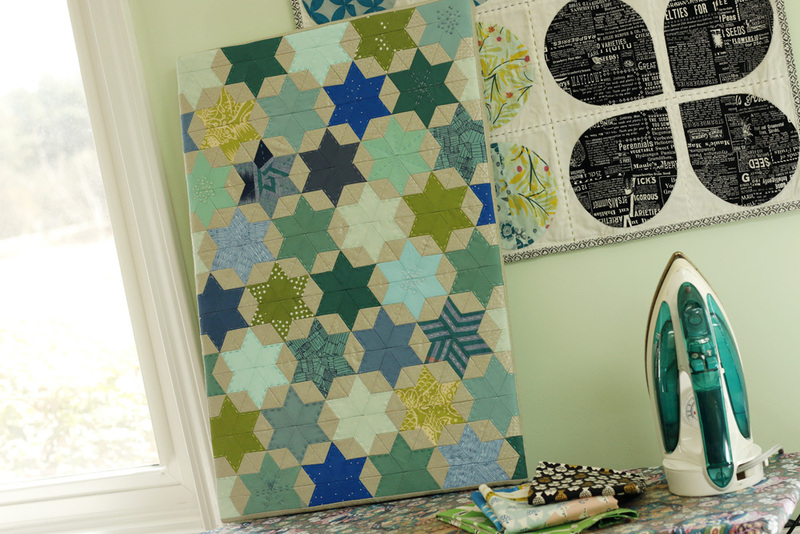 The construction is machine sewn, based on my Starbright pattern that is bundled with several other quilts in my Angled class. (Angled is currently available as a PDF Coursebook.) I miniaturized it for the wall hanging and love the results! 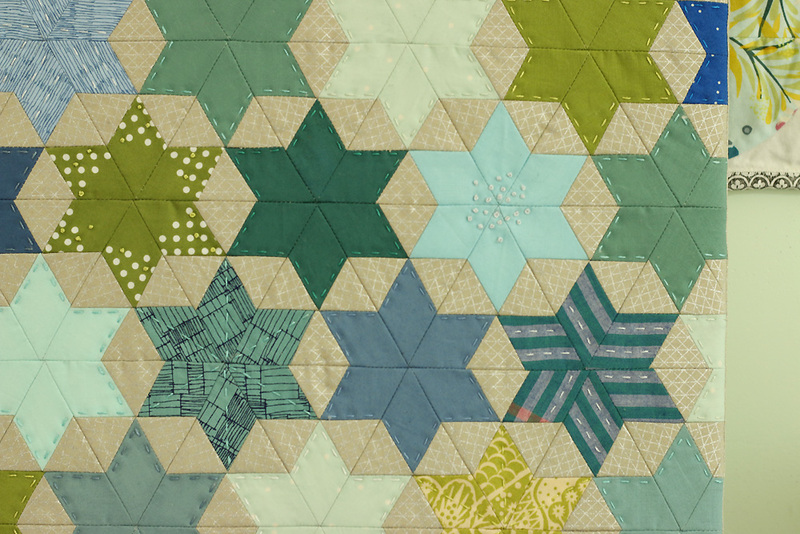 Reminds me of English Paper Piecing, but faster. Then I slowed waaaay down for the hand quilting. I created a variety of playful patterns, not minding the messy backside. It was nice! The new Ombre Confetti fabric collection from V & Co. is definitely turning heads! The prints shade from light to dark plus there are gold metallic specks throughout. All 20 colors available now in jelly rolls, fat quarters, yardage or bundles. Last night Brandon helped me stretch the finished piece on a simple wood frame, a la my Stretched Patchwork Art tutorial. I had used a piece of batting with this project, since it is quilted. Wrapping the corners was tricky since the batting is bulky and wanted to make big lumps at the back of the work. For an easy fix, I simply cut out the batting just at the back corners, leaving the "quilt top" whole. I'm so glad to have this hanging in my kitchen at last! My décor is pretty eclectic, so it's nice to have something that pulls it together a bit. That's one advantage of making your own art.... it always matches!